Sri Aadhi Sankaracharya’s question to Hasthmalaka in their first meeting, enquiring about his name and details forms first verse of Hasthamalakeeyam. In his reply the boy who had been keeping silence until then states first what he is not and then goes on to describe the Real status of the Athma that he is, in twelve verses. In his question Sri Aadhi Sankaracharya, hereafter referred to as Acharya, stated “I am happy to meet you. Please tell me who you are and your name and also wherefrom you are coming and where to you are going?” The boy in the first verse of his reply stated that he is not a human being nor a deva nor a yaksha and none of the classifications made in respect of human beings like caste labels or ashram labels apply to him and he is of the form of innate knowledge meaning pure Consciousness (nija bodha rupa). This pure consciousness, the Athma in all, is elaborated in verses 3 to 14. The refrain of all these twelve verses is: I am the Athma which is the eternal consciousness (nityopalabdhisvarupo’ ham atma. ), while the content of these verses contain the description of Athma as the elaboration of “Thou” in the Mahavakhya “Thou art That” (Tat Tvam asi). We shall now see the description of Athma, one’s true Self, as given in these verses. Athma like the sun which inspires all the activities in the world, inspires all activities of the body, internal and external, i.e. of the mind, intellect and all other sense organs. Though it is intimately associated with every organ of the body it is free from any links to the organs. It is free of the limiting adjuncts of the body; gross,subtle and causal and it is boundless like space. But unlike space, which is insentient, created, an object of knowledge, Athma is not an object of knowledge and it is sentient and uncreated. Athma is drik while space is drisyam (verse 3). Consciousness is the very nature of Athma and not its property like heat which is the very nature of Agni. There is no cold Agni. Mind and other sense organs like eye are insentient by themselves and derive their sentiency from Athma only, like the hot water getting its heat through association with Agni. (verse 4). The face seen in the mirror is only a reflection. It has no independent existence. It has only dependant existence i.e. mithya. Similarly Jiva is only a reflection of Athma i.e. Chitanyam, in the mind. This reflection called Chidabasa along with subtle body is called Jiva and Jiva has no independent existence and is mithya. While Athma is non-dual and one only, Jivas are many. The plurality of Jivas is only an appearance whose timeless truth is the non-dual Athma (verse 5). The empirical plurality of the Jivas is due to the superimposition, on the non-dual Athma, of the manifoldness of the modes, in which this Athma is reflected. When the mirror is removed the reflection only vanishes but not the original face which is in intact. Reflection while reflecting the original, suffers from the defects and deficiencies of the medium of reflection, while the original is not affected by the flaws in the medium. So while Jiva is samsari, karta and bhoktha, Athma is asangha, unaffected and pure. (verse 6) Athma can be called the mind of the mind, the eye of the eye etc, as mind and all the sense organs derive their respective power from Athma only through its reflection, chidabasa while Athma stands aloof from them, beyond their powers of perception.(verse7). An observer whose eye-sight is obstructed by clouds is apt to imagine that the sun is engulfed by the clouds. Similarly ignorance clouds one intellect only and not Athma. Athma is ever experienced Consciousness and so Athma Jnanam and Athma ajjnanam refer only to jnanam and ajjnanam in the intellect and not in the Athma. Athma appears to be bound due to ignorance. (verse12) Athma is like the space associated with all and polluted by none. The transcendence of the boundless Athma is to be seen together with its immanence in all phenomena. On it, but without, in the least, affecting its wholeness and purity, are strung the phenomena constituting the cosmos (verse 13). In the concluding verse 14, the boy explains with the example of crystals and moonlight the fallacy in Acharya’s question “Who are you” as both of them are one only as non-dual Athma, with different upadhis. Just as the pure crystal appears endowed with different colours when associated with different flowers the Jivas having different upadhis also appear different though essentially they are one only, the eternal infinite Athma. Just as the reflected moon appears to move and flutter in running waters, Acharya appears to be different from the boy in that he is wandering and the boy is not. The psycho-physical organisms are multiple and varied in form and posture and Athma in empirical association with them appears to imbibe their forms and movements. Thus the boy points out to Acharya that both of them are the same transcendental non-dual Athma in spite of all their differences, external and internal. 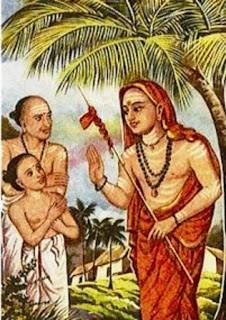 Sri Adi Sankaracharya was so much impressed with this boy Jivanmuktha that he gave him the name Hasthamalaka and took him into his entourage. He also wrote a commentary for Hathamalaka’s words, Hasthamalakeeyam and nominated him later as the first Jagatguru of newly established Dwaraka Math.